For many 16-year-olds this is the ultimate. Updated, definitive, 50cc AM licence sports scooter is smart, cool, a doddle to ride, has stacks of neat design touches and is decently affordable, too. Interested in buying a Peugeot Speedfight? The first Speedfight in 1997 effectively invented the sports scooter class with its swoopy style and sporty specification, was an instant success and set the template for all sports scooters to come. Peugeot themselves have sold over 600,000 examples of it and its derivatives, in both 50, 100 and 125cc form since. 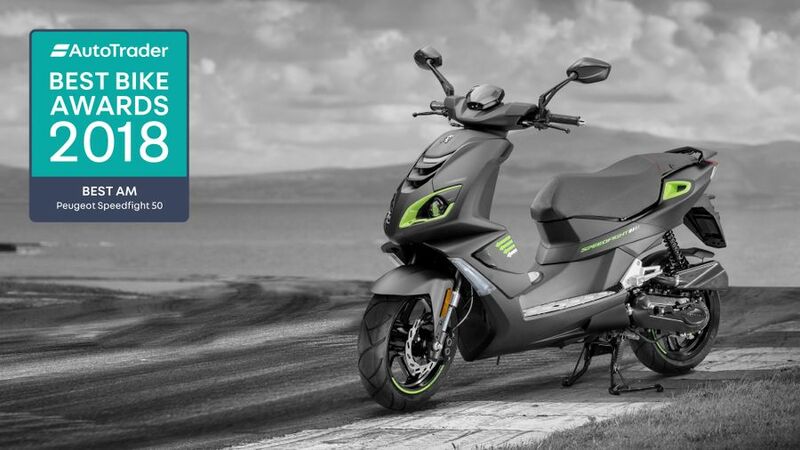 This new fourth generation version – hence the name – was launched to mark that 20th anniversary and features updated styling and engines (in both air-cooled four-stroke and air or liquid-cooled two-stroke form, a digital dash with a backlit LCD display and USB socket – in short everything you could want at 16. The Speedfight4 is still the definitive 50cc sports scoot and its riding position is typical of the breed. The bike itself is fairly small (partly thanks to the small 13 inch wheels) and light (just 100kg); its ‘step-thru’ scooter style means it’s a doddle to get on board and manouvre and the riding position, too, is classic ‘sit up and beg’, putting you completely in control. There’s really no conversation or analysis to be had here – you really do just get on board and go: easy. Powered two-wheel transport doesn’t really get any more practical than this. OK, there are some less sporty, more humdrum 50cc scooters that arguably are even more practical, with added comfort, luggage space or features, but in truth they’re all pretty much of a muchness. 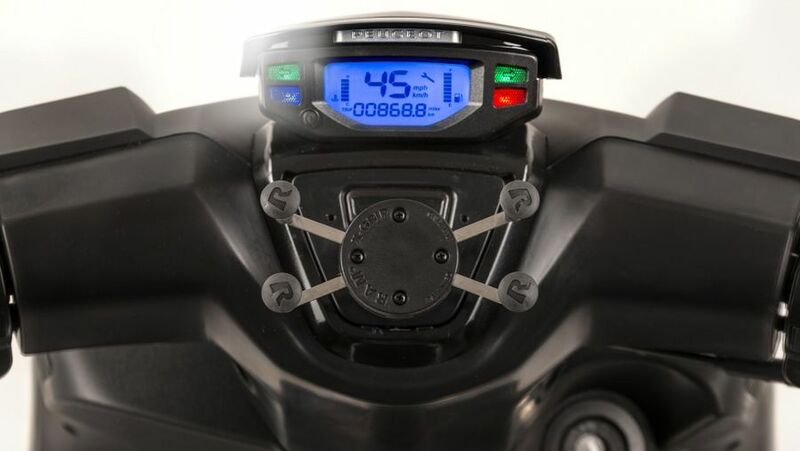 Like the rest of the breed, there’s enough underseat storage for a full-face helmet (or a decent amount of shopping) while its USB socket is neatly tucked away in a small compartment beneath the clocks. Five out of five may sound overly generous for a 50cc scooter restricted by law to 30mph but the latest Speedfight simply smashes what it sets out to do. 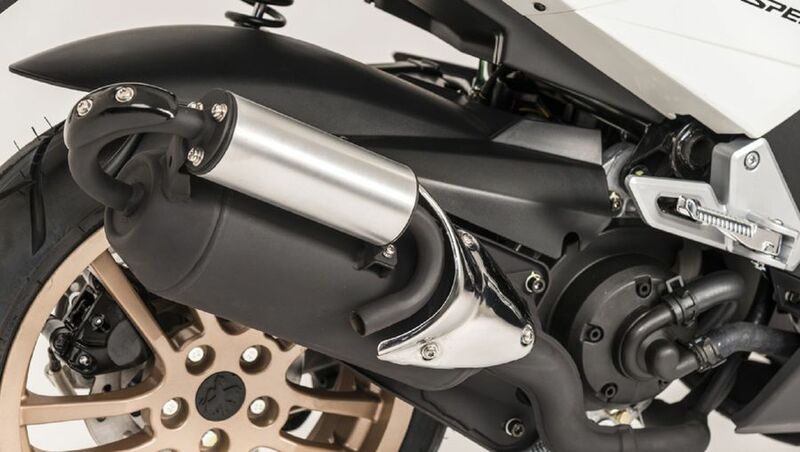 The latest engines are perky, easy and economical – certainly as good as anything else in the class and rugged and reliable, too. 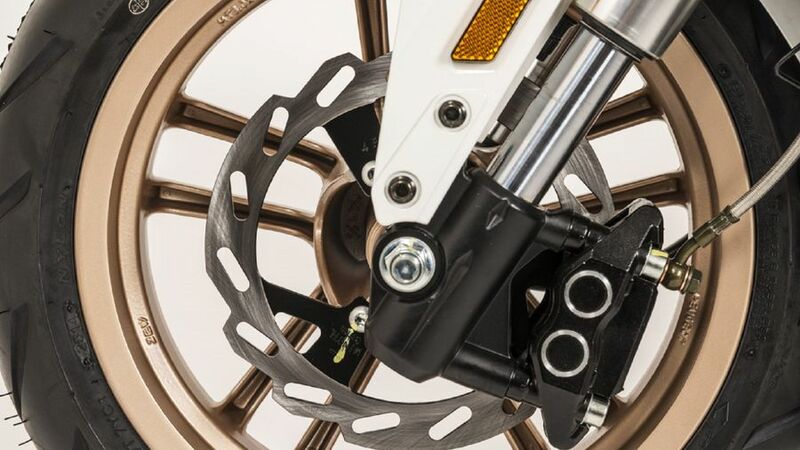 While the brakes, although ‘only’ a single 215mm disc at the front grasped by a twin-piston caliper at the front with an even smaller 190mm disc and single piston caliper at the rear, they’re powerful and more than up to the job. 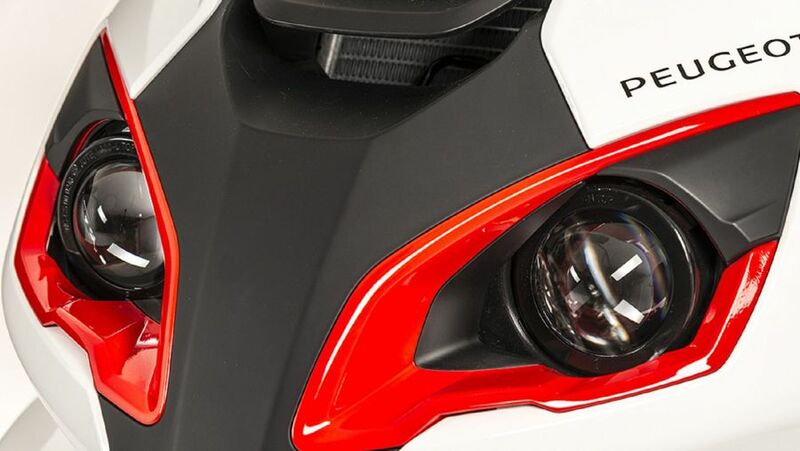 Again, as with its performance, the latest Speedfight4, while hardly revolutionary, is pretty much the definitive 50cc sports scooter, with all the handling traits and characteristics that go with the breed. As such it’s brilliantly light and nimble, great for terrorizing across town. Its ride is better than most although still a little budget and basic as is also inherent with the type and those 13in wheels, can be a little skittish compared to say, un-sporty 15inchers – but that’s what you get with scoots of this style, too. Peugeot scooters’ standard warranty is on a par with all the leading motorcycle manufacturers being a two-year, unlimited mileage, manufacturer backed, parts and labour affair, which is certainly more than you get from some lesser scooter brands, so there’s nothing to fear here. Servicing meanwhile, simply because the Speedfight4, like most 50cc scooters, is so simple and straightforward, is routine as well. 50cc sports scooters targeted at 16-year-olds are never the most luxurious of transport but the Peugeot Speedfight4 is certainly better than most. Snazzy styling, sports alloy wheels and sporty (looking at least) suspension and brakes are all better than most while new additions include the aforementioned backlit LCD instrument display (where most rivals are still analogue) plus the useful USB socket. Things are very simply with the Speedfight4, really. If you’re 16 and want some powered transport and independence, your only options are either an AM licence 50cc motorcycle or, more likely (‘cos they’re simpler, cheaper and, for most, just as cool) a scooter. And if you’re after a scooter, it’s a sure thing that the most desirable of all, thanks to its name, heritage, style and spec, is the Speedfight4. Nothing else really comes close.